Definition at line 25 of file AMDGPUArgumentUsageInfo.h. Definition at line 41 of file AMDGPUArgumentUsageInfo.h. Referenced by llvm::SIMachineFunctionInfo::addDispatchID(), llvm::SIMachineFunctionInfo::addDispatchPtr(), llvm::SIMachineFunctionInfo::addFlatScratchInit(), llvm::SIMachineFunctionInfo::addImplicitBufferPtr(), llvm::SIMachineFunctionInfo::addKernargSegmentPtr(), llvm::SIMachineFunctionInfo::addPrivateSegmentBuffer(), llvm::SIMachineFunctionInfo::addPrivateSegmentWaveByteOffset(), llvm::SIMachineFunctionInfo::addQueuePtr(), llvm::SIMachineFunctionInfo::addWorkGroupIDX(), llvm::SIMachineFunctionInfo::addWorkGroupIDY(), llvm::SIMachineFunctionInfo::addWorkGroupIDZ(), llvm::SIMachineFunctionInfo::addWorkGroupInfo(), allocateSGPR32InputImpl(), allocateSpecialEntryInputVGPRs(), allocateVGPR32Input(), llvm::SIMachineFunctionInfo::setPrivateSegmentWaveByteOffset(), and llvm::SIMachineFunctionInfo::SIMachineFunctionInfo(). Definition at line 45 of file AMDGPUArgumentUsageInfo.h. Definition at line 61 of file AMDGPUArgumentUsageInfo.h. Referenced by llvm::SIMachineFunctionInfo::addDispatchID(), llvm::SIMachineFunctionInfo::addDispatchPtr(), llvm::SIMachineFunctionInfo::addFlatScratchInit(), llvm::SIMachineFunctionInfo::addImplicitBufferPtr(), llvm::SIMachineFunctionInfo::addKernargSegmentPtr(), llvm::SIMachineFunctionInfo::addPrivateSegmentBuffer(), llvm::SIMachineFunctionInfo::addPrivateSegmentWaveByteOffset(), llvm::SIMachineFunctionInfo::addQueuePtr(), llvm::SIMachineFunctionInfo::addWorkGroupIDX(), llvm::SIMachineFunctionInfo::addWorkGroupIDY(), llvm::SIMachineFunctionInfo::addWorkGroupIDZ(), llvm::SIMachineFunctionInfo::addWorkGroupInfo(), llvm::SIMachineFunctionInfo::getImplicitBufferPtrUserSGPR(), llvm::SIMachineFunctionInfo::getPrivateSegmentWaveByteOffsetSystemSGPR(), llvm::SIMachineFunctionInfo::getQueuePtrUserSGPR(), llvm::SIMachineFunctionInfo::getWorkGroupIDSGPR(), llvm::SITargetLowering::isTypeDesirableForOp(), llvm::AMDGPUTargetLowering::loadInputValue(), and llvm::SITargetLowering::passSpecialInputs(). Definition at line 66 of file AMDGPUArgumentUsageInfo.h. References assert(), print(), StackOffset, and TRI. Definition at line 57 of file AMDGPUArgumentUsageInfo.h. 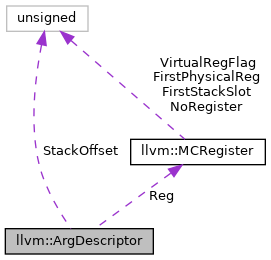 Referenced by llvm::AMDGPUTargetLowering::loadInputValue(), and llvm::SITargetLowering::passSpecialInputs(). Definition at line 49 of file AMDGPUArgumentUsageInfo.h. Definition at line 53 of file AMDGPUArgumentUsageInfo.h. Referenced by llvm::AMDGPUArgumentUsageInfo::getAnalysisUsage(), getStackOffset(), and llvm::operator<<(). Definition at line 28 of file AMDGPUArgumentUsageInfo.h. Definition at line 27 of file AMDGPUArgumentUsageInfo.h. Definition at line 31 of file AMDGPUArgumentUsageInfo.h. Definition at line 32 of file AMDGPUArgumentUsageInfo.h.